Sorry no blog post for a week, but as usual, life is crazy. The end of the school year is here... only 5 more days with students and two inservice days to go! Tomorrow is field day, so I am trying to get things together for that. I am still trying hard. My goal right now is to do the best I can to stay low-carb, and I am literally taking it meal by meal. There are so many parties, celebrations, and potlucks it is so hard to just say no to EVERYTHING. To top it off, I am going out of town this weekend, and then my birthday is next week (and I plan on celebrating BIG this year). But so far, my weight has remained steady. I have gained about 1/2 lb, so not bad. Overall, I am still eating much less carbs than normal for me. And I feel so much more conscious about my food choices. Yesterday, we had a potluck at school, where I gave myself permission to eat what I wanted, including dessert. Out of habit, I put about 3 different desserts on my plate... and only ended up eating one! Everything tastes so sweet now, it was just *enough*. And I didn't feel the need to keep stuffing the rest in my mouth. Being able to make that choice feels good. It feels very "real life"... I would love to be at goal weight one day and still be able to enjoy dessert every now and then. 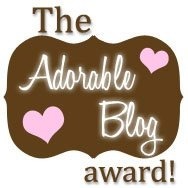 I also received a blog award the other day from Chrissy... Thanks! I never follow blog award rules... sorry... but I am so appreciative! Oh for a teacher May is such an extremely busy season! I prayed for you while I walked this morning and I will keep it up! You are changing lives, and I admire you for all the time and work you give for those students! Keep hanging on diet wise...hopefully summer will be a little less hectic! Great to see you back. Sometimes the best way is to take it one day...even one meal at a time. The important thing is to not give up even if you mess up. You can do it!!! Grace and Peace. I'm so thrilled to read this! I too focus on the overall improvement rather than on monitoring every single bite. There will be special occasions or nights that you just want a treat. It's cool man. :-) I've been doing low-carb for 6 weeks, and about 2 weeks in I was craving sugar, so I decided to treat myself and bought a bunch of mini cupcakes. I thought for sure I was going to eat half in one sitting. I had one and was sort of disgusted. It was waaay too sweet. I used to eat sweet daily and in large amounts, but now I have just tiny pieces or very low-sugar treats, and I don't feel guilty at all. When is your birthday? Mine is Tuesday and I'll be 40. My weight doesn't reflect it yet, but I feel better than ever. I have energy, I sleep better, I don't have heartburn anymore (used it have it throughout the day), and I get plenty to eat. Just wanted to let you know, you were one of the winners of my latest giveaway. Send me your address so I can get it out to you. Ditto to Lexxi's post - THANK-YOu! Your blog is very pretty to look at and pleasant! I can't believe I didn't think of looking for other people out there who had the same goals as me! I think I will probably check the rest of your blog out I think it's really interesting! Isabel has a different approach to diet instead of staving ourselves or exercising steady. I know at least I can't stick to those routines. She concentrates on eating more fat burning foods instead. There is a link to her diet on my blog here http://www.howtoreducethighs.org if your interested. Thank you for the inspiring blog by the way.